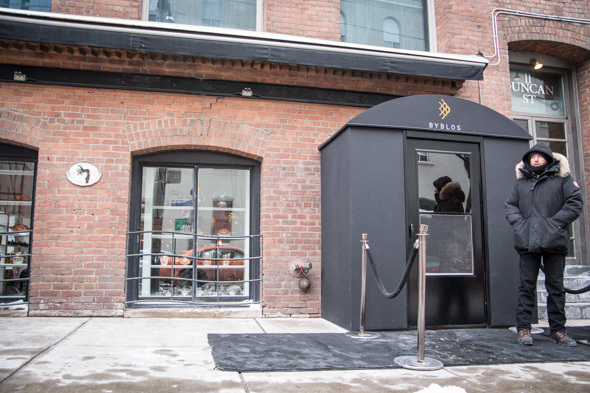 Byblos, located on the first two floors of the Storys Building, is the latest venture from Charles Khabouth and Hanif Harji, the same pair behind Weslodge and Patria . 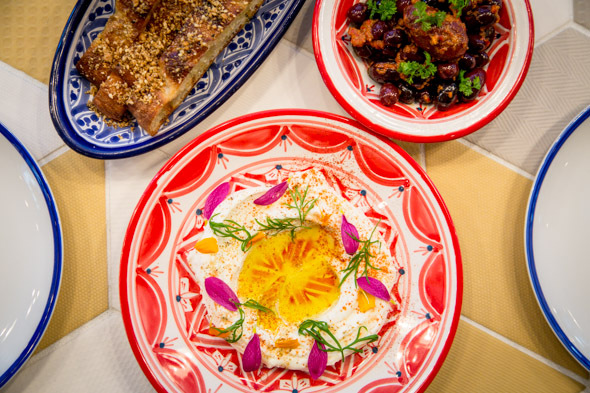 As I've come to expect from the duo, the new restaurant is highly stylized and intently themed, this time drawing inspiration from Eastern Mediterranean regions. Descending the entrance steps, one arrives in a surprisingly bright and airy white-bricked space swathed in soft colours, geometric tile work, and gem-cut furnishings. 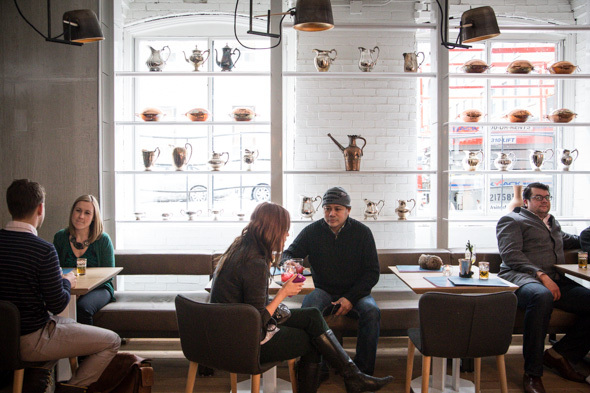 Hanging shelves lined with glassware and jars of preserved lemons cast diffused light throughout the room. 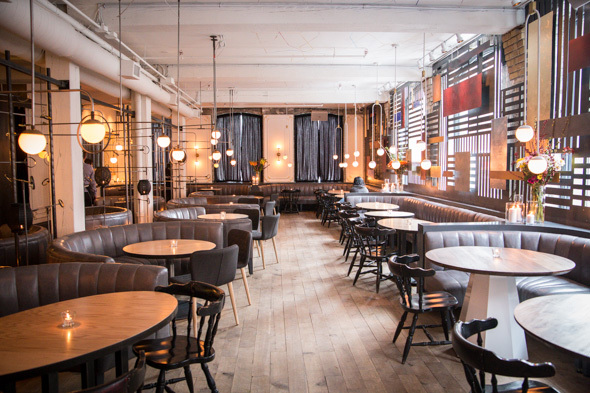 Upstairs is darker, offering a sultry lounge furnished with luxe upholstered booths. The menu from Stuart Cameron is centred around a shared experience that starts with mint tea and traditional mezze plates that are meant to be ordered en masse. House-made labneh ($6) garnished with olive oil, fennel pollen, honey and paprika is the perfect match with impossibly fresh bread. Barbari, baked daily in the wood oven at Patria, is drizzled with olive oil and dusted with dukkah , an Egyptian spice mix made of ground hazelnut, coriander seeds and sesame. Olives ($5) are offered three ways on the menu, spiced with preserved lemons, harrisa or fel fel , a chili breadcrumb marinade that offers some heat. 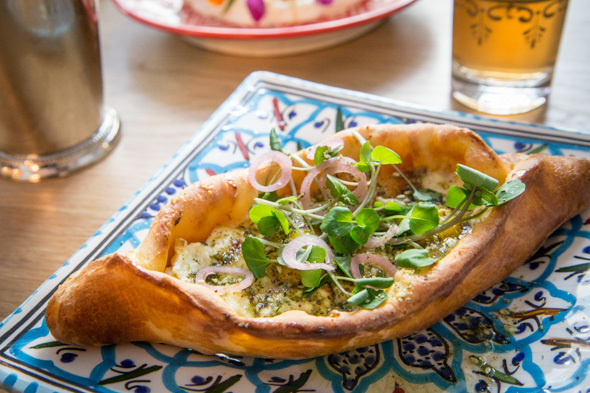 Acharuli ($7), a take on the popular Georgian street food is baked into a brioche pocket layered with a base of harrisa and filled with fresh cheese, soft quail eggs and a smattering of za'atar. 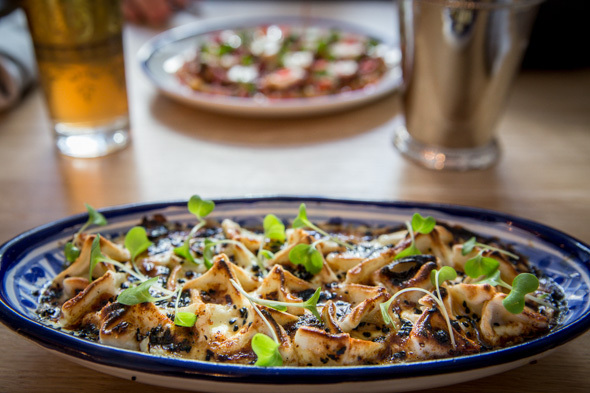 Turkish manti dumplings ($12) are hand-formed from delicate wonton wrappers pursed around a smoky eggplant filling, baked in yoghurt sauce and finished with molasses and nigella seeds. Jewelled rice ($16) served in a clay pot is an instant showstopper. 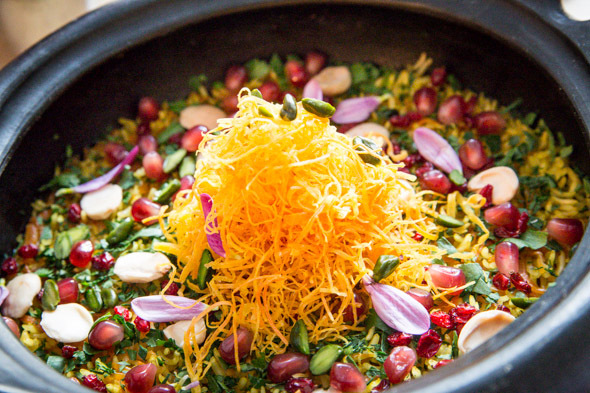 Adorned with pomegranate seeds, almonds and fried carrot zest, it's mixed through once presented to the table offering crunchy textures and pops of sweetness in each bite of saffron scented rice. 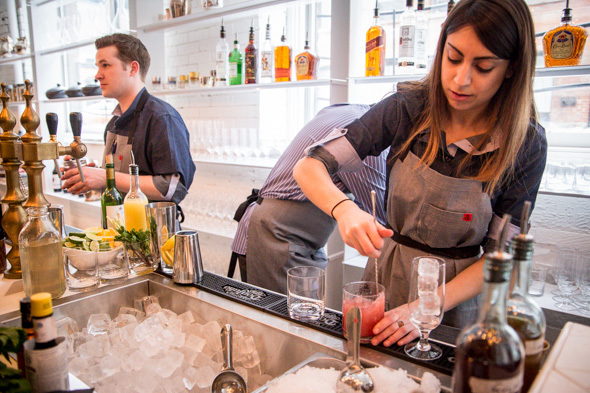 The bar menu developed by Wes Galloway is cocktail-focused, featuring selections by the glass or served in communal ceramic punch bowls. I try the Gulab ($13), a sweetly fragrant rosehip vodka flavoured with house-made pomegranate reduction, lemon and cardamom tincture served over crushed ice in a julep glass. Byblos is open for dinner from Monday to Saturday starting at 5pm. A patio out front is planned come warmer weather.